This is a sponsored post by Coupons.com. All opinions are 100% mine. I absolutely loved working with Coupons.com back in the fall for our Sleepy Hollow Halloween Party. So, when I got asked to join in and share some spring trends for the home, I immediately jumped on board! I decided to give Amazon a go for this project because I had some specific things in mind. Plus, paired with Amazon Coupon Codes, it was a great deal! I decided to take a different approach for my inspiration. While home styling is absolutely my first love, y’all know I have a sweet spot for fashion too. Three stuck out as my favorite and something I wanted to bring into my design. I feel like florals are always a trend for spring, but I love the bright orange they’re bringing in this year. Black and white is classic, but always a winner. And since white is my favorite color to decorate with, I jumped at the chance to bring in more white. And fringe? Yes. I love me some fringe! So, I went to Amazon in search of things to bring these spring trends to life. 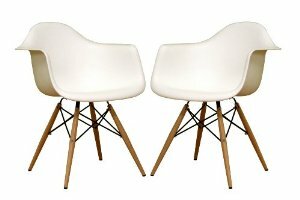 I have loved these white Eames-style Armchairs for so long. I love the white and they just feel bright and fresh to me. I pictured these on either side of my mantle, so the next step was figuring out a little spring mantle styling! Love the chairs. They really lighten up the room, while adding in some style. For the mantle, I decided that I wanted to use some fringe for a garland. Amazon has fringe trim in every color you can imagine! I knew I wanted to experiment with my new favorite trend: Balanced Assymetrical. So, I chose three colors: teal, white, and light blue. 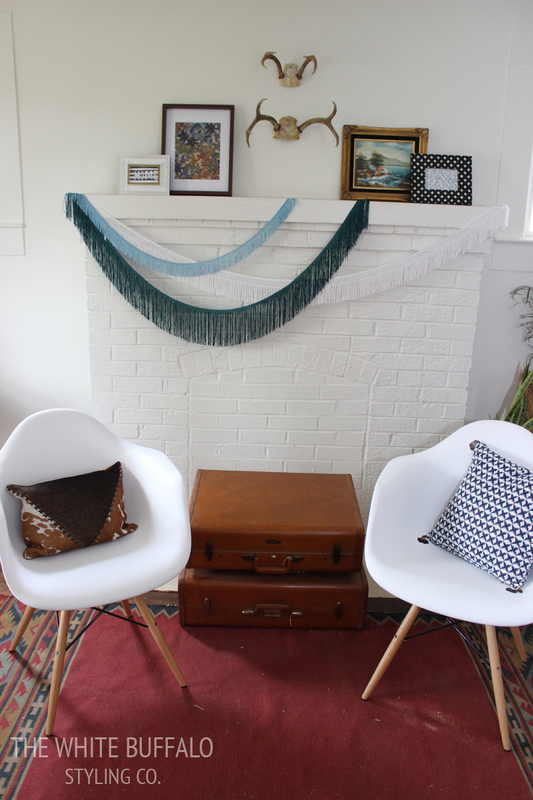 This was probably my favorite part of freshening up our Lounge with some spring trends! I brought in some black and white with frames and art. And I found a floral shirt that I loved the print of at Goodwill and framed a piece of the fabric. I kept the mantle design a bit simpler than I usually go for, but to me, spring means clean. A cleaner, simpler look was appealing. Especially the chairs and that fringe. It’s got to stay. 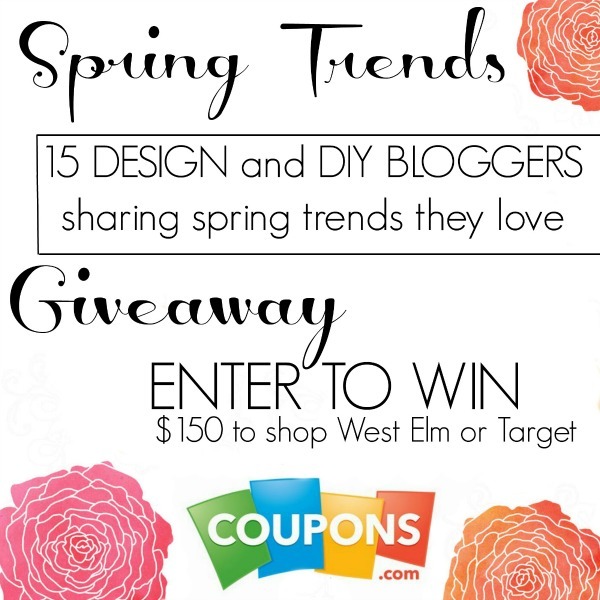 I’m doing this with 14 other bloggers! They’re all sharing their take on spring trends and I know you’ll be inspired, so make sure you go check theirs out! 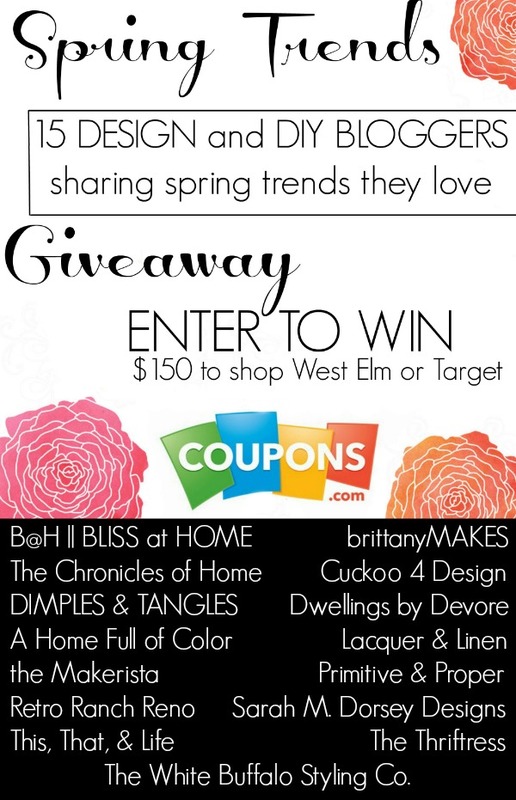 Coupons.com is giving away a $150 giftcard to West Elm or Target to one of you lucky readers!!! Make sure you enter below! Then you can spruce up your home with some spring trends 🙂 And make sure you check Coupons.com for coupon codes, like my Amazon Coupon Codes. It can seriously save you money! Today is the first day of Creating with the Stars!!! Have you seen the projects???? I am totally amazed at all of the talent in this content. I love the term, “Go Big or Go Home.” Well, every single contestant did that this time! I’m really honored to be lumped in with such amazing talent! You can vote today and tomorrow, so make sure you head over and cast a vote for your favorite. Obviously, I can’t tell you which one is mine, but I know they’ll all be awesome, so pick your favorite and vote away. First round results will be announced this Wednesday! 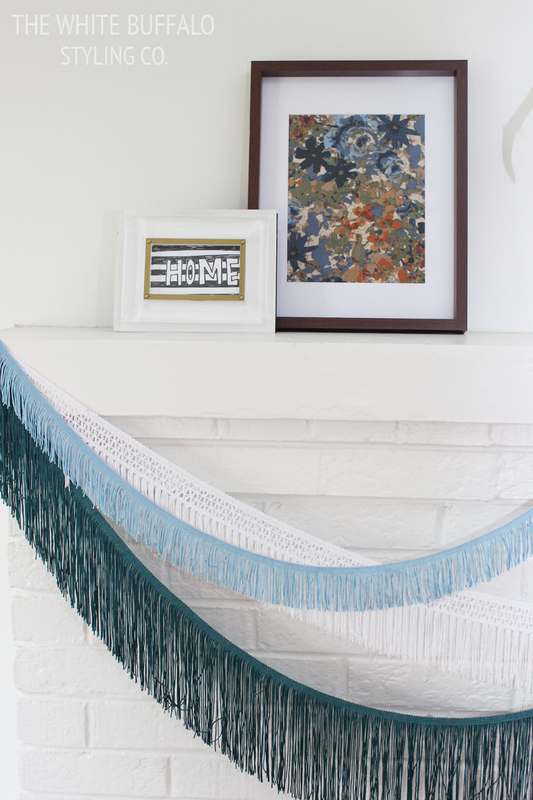 The fringe on the mantel is genius! Never seen it anywhere before. Ok, I just voted and I have a sneaking suspicion that it was your project. It just screams Lindsay to me! oh that fringe is SOOOOOO fun! love it! always love your styling! Love the fringe! And I love the simplicity of the mantle too. Just gorgeous! 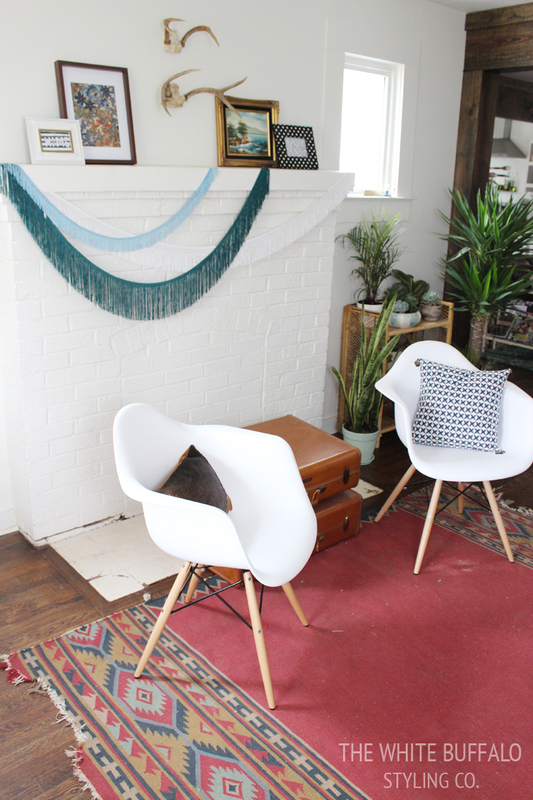 That fringe and those chairs…oh my! I’ve been eyeing those chairs for our dining room for quite some time now. Maybe you’ve just inspired me to pull the trigger! Love your new chairs, Lindsay! 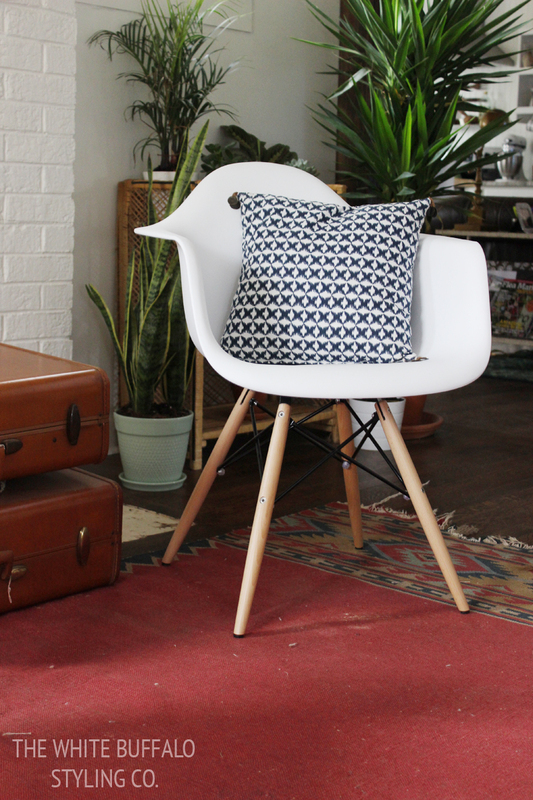 Your lounge looks so stylish and comfy. Rooting for you in CWTS! LOVE those mid century chairs. I am off to vote! Good luck! Hello, yup this paragraph is grnuinely fastidious and I have learned lot of things from iit on the topic of blogging. I’ve had my eye on those chairs, too! They look great and I’m digging that fringe. Love those chairs Lindsay! And the fringe is awesome!!!! Those chairs are great, so versatile! I love what you did with the fringe, it’s so creative! Lindsey you are so talented 🙂 love the fringe!! I am so ready for the spring weather to go with the decor! In love with the chairs and the fabric print! I am not-so-patiently waiting for the backyard reveal! I am in love with all of it! 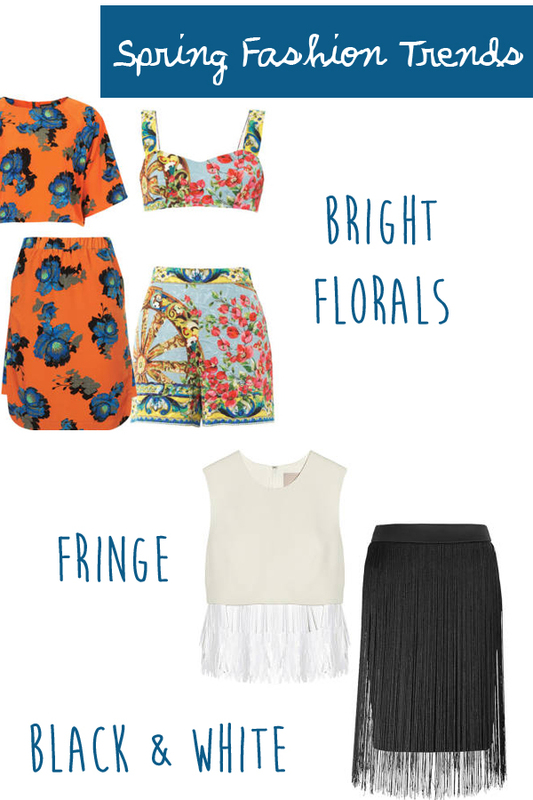 Ordering some fringe now! Thanks for the great idea! Love the chairs, look perfect in your space. The fringe is beautiful. So cute! I love Eames chairs, and that fringe garland is SO cute! Loving the balanced asymmetrical as well. Good job! Love your style! Come to my house! That fringe is marvelous!! Oh my goodness. LOVE the asymmetrical fringe! I always feel so inspired by your blog- Thank You! Loving the fringe are those chairs are fabulous! 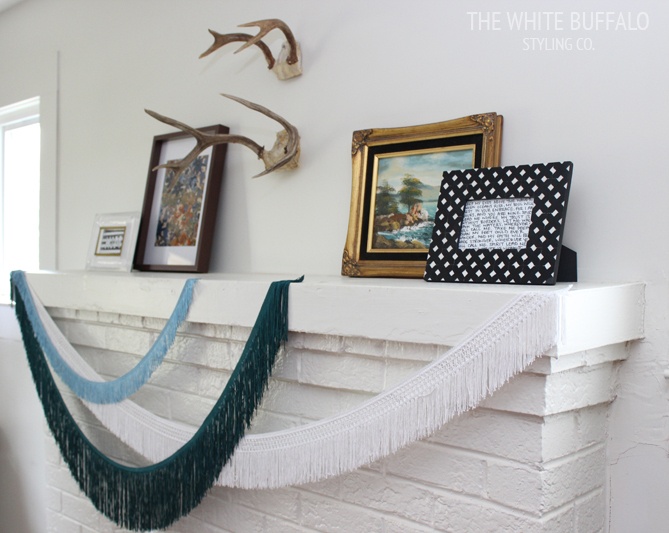 I love, love, love the fringe garland especially against the white fireplace and mantel! It does look so clean and of course the chairs!! 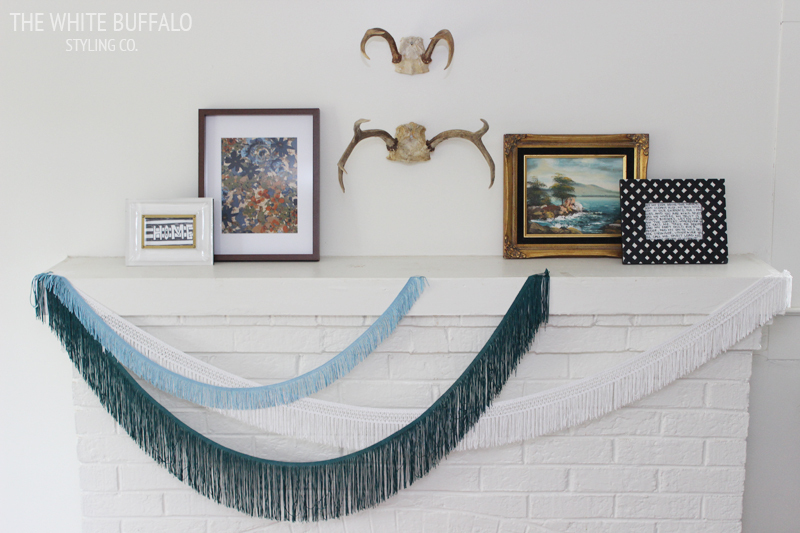 Love the way that fringe looks on your mantel, so clever! I’ve always liked those chairs too, they look great in your home! 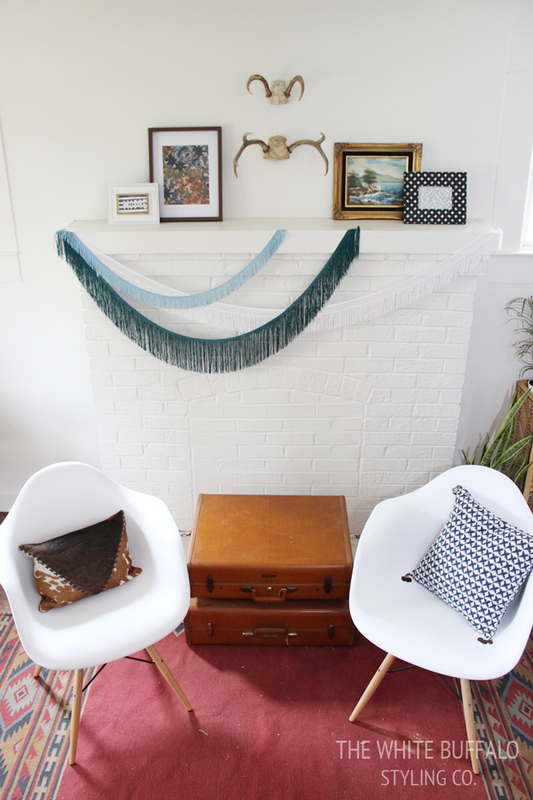 I love how the fringe adds some pizzazz to the mantle! I love your spring decorating, and agree that it would be awesome all year long! Thanks for sharing. I’m loving those chairs! They’re so adorable! Can’t wait to see who wins the contest. I’m keeping my fingers crossed! I love your spring updates, especially those chairs!!!! I’m definitely in the Spring means Clean mind set myself! Good luck on CWTS!!! The fringe!! I’m in love! Love love love the fringe garland! I never would’ve thought to use it that way! Ugh…I bought a similar chair last fall at Home Goods that I thought was a steal. But you got TWO for the same price. *kicking myself* Awesome find! I am commenting and would love to win! Nice spring update! Definitely fresh, clean and original. Love love those chairs! They’re so cute in your home!